First, go to your local grocery store and buy one of those boxes of roll-up ready to use pie crusts, like Pillsbury in the red box, or the store brand–they’re about the same. Then get yourself two bags of apples–you know, the cheap ones that you don’t really want to eat for lunch. Gala is good, or you can mix and match with Golden Delicious or Granny Smith. The bags are usually about 3 pounds each. You’ll also need some nutmeg if you like it, cinnamon, white sugar and brown sugar, and a lemon. 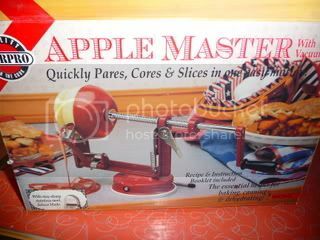 Follow the instructions on how to peel, core and slice your apples. It only takes a couple of minutes to peel all those suckers. They come out like a whole apple, but in a spiral slice, kind of like a ham. You’ll have to cut it in half so you get normal slices. Squeeze about a quarter of the lemon on top so they don’t turn all brown and also so they’re a little tart. Add 1/2 white sugar and 1/2 brown sugar, I’d say about 1/2 cup to 3/4 cup of each. Taste them though, to see how sweet they are. Next add about a Tbsp or so of cinnamon and a couple grates or a shake of nutmeg. Mix well with your hands. 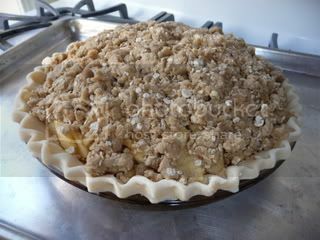 Roll your room temperature-ish (just leave them on the counter when you start the apples and they’ll be perfect) pie crusts into 2 shallow glass or tin pie pans. Crimp the corners. Next, make a streusel of 2 cups AP flour, 1 cup brown sugar, a big handful of quick oats and 1 cup room temperature butter. Mix it up with your fingers till it’s like pea gravel. If it’s too mushy, add some more flour or oats. 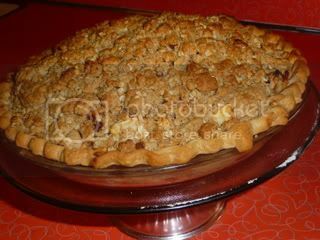 Split your apples between the 2 pie crusts and then top with the streusel. Pat them down so they don’t fall out. 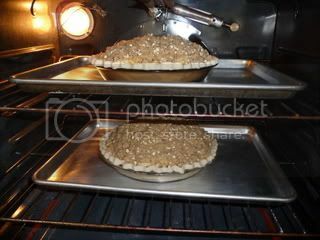 Place the pies on a cookie sheet (1 pie per sheet). and bake for 45 to 55 minutes. If you have convection, most likely 45 minutes will work. I hope you remembered to buy some vanilla ice cream…. 1 box of 2 rolled-up, ready to use pie crusts, such as Pillsbury in the red box. Mix apples with sugar, spices, lemon and flour. Assemble crusts in 2 pie pans. Put together streusel with fingers till the size of pea gravel. 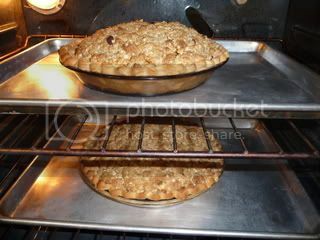 Fill crusts with apple mixture, pat down, then top with streusel and pat down. Place pies on cookie sheets. Bake on 2 seperate racks for 45-55 minutes, or until crust and streusel is golden brown. Eat and feel Mom's love.